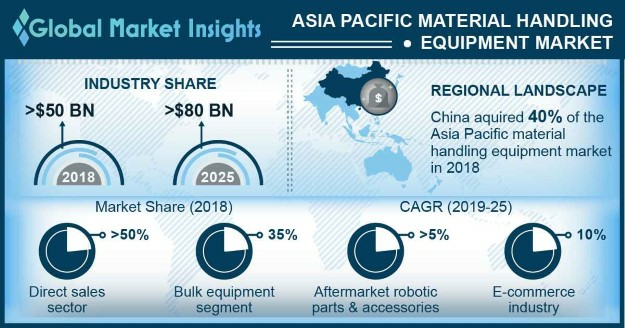 Asia Pacific Material Handling Equipment Market size is set to exceed USD 80 billion by 2025; according to a new research report by Global Market Insights, Inc. The shipments are expected to grow at a CAGR of around 7% from 2019 to 2025. APAC material handling equipment market is experiencing high growth with the strong presence of companies offering robotic technologies for warehouse automation. The growing demand for these automated solutions for supporting several warehouse operations such as packaging, transportation, storage, and retrieval will accelerate the demand in the Asia Pacific material handling equipment market. Moreover, the increasing labor costs are forcing industries to shift their focus toward robotic technologies. Increased operational efficiencies and productivity with the applications of these systems in the warehouses are helping companies to improve their sales and productivity. Regulatory authorities in the region are developing several initiatives that are generating a high demand for automated technologies. In 2018, China accounted for around 40% of the Asia Pacific material handling equipment market share. The Made in China 2025 initiative by the Government of China is accelerating the production rate of the country. It is encouraging global and domestic companies to establish their manufacturing facilities within the country to support this initiative. These manufacturing facilities will require automated technologies for enhancing and improving production capabilities and operations, boosting the APAC material handling equipment market demand. Furthermore, the manufacturers are also helping small-scale companies to purchase these automated machines by flexible loan and financing options. This is aiding companies to install modern equipment in their facilities within the budget range.